Detailed Description: I am unable to create a domain articles.eu.org because I am using cloudflare dns. Getting the Error XID 66vcd3) Sorry, the domain is already pointed to an IP address that does not appear to use DNS servers associated with this server. Please transfer the domain to this servers nameservers or have your administrator add one of its nameservers to /etc/ips.remotedns and make the proper A entries on that remote nameserver. I have already pointed the cloudflare A record to our server ip. @binil I've parked the domain in WHM on top of your primary domain. If you check your domains articles.eu.org is now listed there. You can manage the domain in your cpanel. You can also remove it as you wish. I checked and doesn't look as though there is any other way to add the domain to your hosting account. I suggest that you create an Index page for it as soon as you can as it is presently showing your directory. There is also another way for the directory not to show, but I'll leave it for you to do with cpanel. You can find that option in the first group of links - Directory Privacy. (11-13-2018, 06:32 AM)Genesis Wrote: @binil I've parked the domain in WHM on top of your primary domain. If you check your domains articles.eu.org is now listed there. 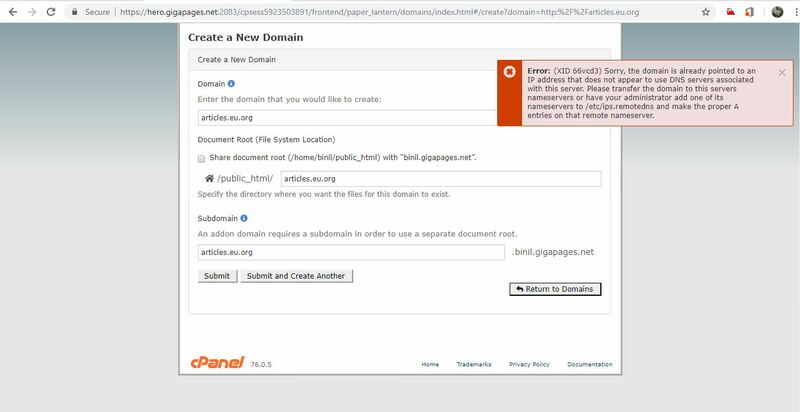 You can manage the domain in your cpanel. You can also remove it as you wish. Thank you Genesis for trying to help me. But it wasn't working for me. So I had to remove the one you created, pointed the name servers in the domain to gigarocket's, then created the domain "articles.eu.org" with the documenet root - /public_html/articles.eu.org. Then changed the nameservers again in the domain to point to cloudflare's. Now its working. So now I am marking this as solved. Glad it worked out @binil.